Focus is a constant activity necessary for clarity. 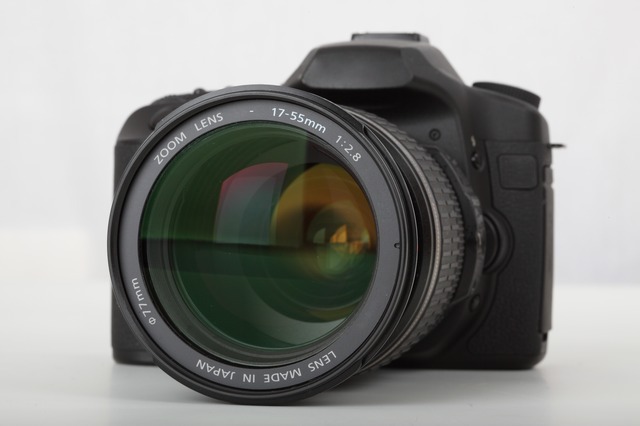 Skilled photographers prefer manual focus over auto-focus. It’s because they trust their eyes more than they trust a microchip. It’s also because they have better control over the quality of the picture, or the outcome. The thing about focus is that it changes with even the slightest movement. Move one inch in any direction and the focus needs to be adjusted. You’ve got to be constantly monitoring things with your eyes. It demands careful attention. Focus isn’t merely an art for photographers. Or creatives. Or business people. We all need it. It’s about focusing on the things that really matter. 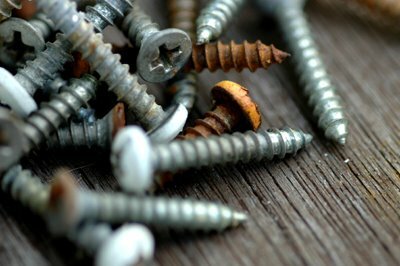 It’s like this photograph of a pile of screws. The focus is primarily on just a few screws in the pile. They’re in clear focus. The others are out of focus. Some are more out of focus than others. That’s the price paid for focusing on just a few. I’m sitting with an executive the other day and repeating advice that I distilled years ago when I found myself with an organization confused about the priorities. If employees had been asked, “What’s important?” they’d have answered, “Everything.” We think that may be the correct answer, but it’s not. It’s terribly wrong. And impossible. If there are two pieces of wisdom I have sought to pass onto others this is right at the top. The other one is, “The quality of our questions determines the quality of our work.” Admittedly, that last one presupposes that we’re not just asking the questions, but we’re answering them. And with equal or superior quality. But today it’s about focus and figuring out what really matters. That second piece of wisdom enters into it because I don’t know how we can do that without asking questions. Tough questions. I’ll ask them to just pick one. Usually, they quickly make their selection. I’m prone to only ask this question once I feel I’ve gained enough insight to think I know the answer. The answer is important. If the leader sees things for how they really are, then the answer in my head usually matches the one they give. If the leader is trying to give the “right” answer and not being fully honest, then it shows. Either way, I gain some insight that may be useful in our work moving forward. I’d say mostly I hear the truth. Most leaders that I work with are honest, truthful and not deluded. It’s why they’ve engaged me. I don’t find deluded leaders often reaching out for any assistance. So I doubt my sampling is very scientific, but even so it’s helpful when we’re working on focus issues. 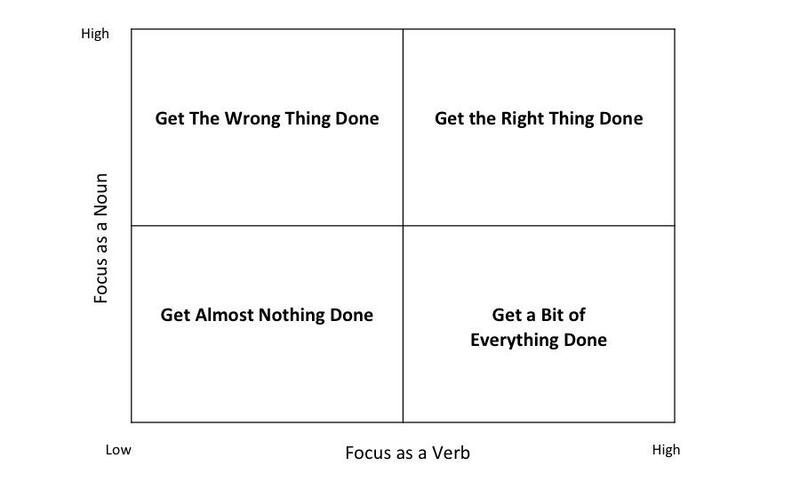 Organizations tend to concentrate more on one of these one word questions than the others. Top leadership determines which is most important. And they can change over time, but mostly I think a culture gravitates to whatever the CEO or top leader pushes hardest. In spite of all the talk about “anybody can be a leader” I’ve not found it to be the case in a practical matter when it comes to an organization’s culture. Not all leaders are created equally. The person at the top has far more to do with organizational focus than anybody else. The senior vice-president may answer with some things the CEO has mandated. The COO may answer with some things the board has mandated. The shift supervisor may answer with some things the plant manager has ordained. So it goes. We all answer to somebody. Even the CEO/founder of a privately held company must answer to financial partners, suppliers and others. None of us are in full command of our agenda or focus. But let’s drive this down to where we all live and see if we can’t learn some things, or at the very least, get the wheels turning so we can elevate our own performance (and hopefully the people around us). I confess that I’m naturally wired to ask one question more than all the rest, “Why?” The reason or outcome of a thing has always been my natural focus. Not everybody sees the world that way and I’ve learned to appreciate that. It wasn’t easy, but I worked at it. In my mind the “Why?” connects quite easily to helping answer the others. For example, I enter a company steeped in paperwork forms. As I assemble the stack of these I’m asking, “Why?” all along the way. An explanation is given on some. For others, nobody remembers why that form was created in the beginning, but it’s been in use for so long everybody assumed somebody needed it. Turns out there’s a lot of crossover work being done, meaning there’s a ridiculous amount of redundancy in the work. Rather than capturing information once, in some centralized location, the company is making multiple people gather the same information at multiple points along the way. The why answers the who, what, when, where and how. Who is gathering this information? Who benefits from this information? What are we doing with this information? When is this information being gathered and when is it being put to use? Where in the process are we gathering this and where does this information end up? How is this useful? So while I admit my own inclination toward, “Why?” that’s not why I suggest it trumps all others when we’re talking about focus…I think it trumps the others because more than any of the others, it direct connects all of the others. It’s the reason for things. And isn’t that what focus is about. Isn’t that the reason for the lens being focused on just a few screws in that photograph instead of being focused on all of them? The photographer seemed to be focusing on the rusty screw and the head of the top screw. By doing that, a couple of other screws got some focus, too. But the others just didn’t matter as much. We see them. We know they’re screws. They’re just not as important as the ones getting most of the focus. Just a few screws were the reason for the focus. What’s your reason? Simon Sinek wrote the book, Start With Why. Simon is a lot smarter than me so I’m happy to know somebody who confirms what I’ve long practiced. Why is focus so hard? I guess there are millions of reasons but today I’m focused (see what I did there?) on one, distraction. Distraction isn’t merely the kind you think about when you consider texting while driving (watch this video and urge your kids to watch it, too). Distraction happens when we try to do too many things at one time because they’re all important. Again, if everything is important then nothing is important. That is, if we’re focused on everything and everything is vying for equal attention, then we’re going to end up disjointed and focused on nothing. No matter what your career path, focus is important, if not urgent. We all need to be able to answer the one-word question about our own career. What one-word question best describes your career and your approach to your career? Much of my work involves helping executives learn who they serve. Particularly lower level executives who wear titles like “deputy” or “vice” or “assistant.” Often these people are in the trenches, albeit at a higher level. They’re more involved in the daily grind than their bosses. As a result they can tend to view things from a much lower altitude, and they must. But as they’re flying close to the ground they’re often unable to appreciate the higher view held by their boss and sometimes they can resent things they don’t clearly see. It’s just one reason some lower level executives struggle with second guessing their bosses instructions, or why they may find it difficult to salute the mandates they get from their boss. It’s all about knowing who your number one customer is. Answer: It’s always your boss. Sometimes the biggest career benefit I can give somebody is helping them better understand the value proposition of their career. Provide value for your boss and you’ll benefit. Provide higher value for your boss and you’ll greatly benefit. I see it everywhere I go. The person who can properly read and correctly anticipate the needs of their boss is the superstar. The person who can’t or won’t do those things is a burden and will soon be displaced. I can’t offer many guarantees, but I’ve seen this one play out many time through the years. I guarantee it. It’s hard to focus on the needs or wants of your boss when you don’t agree though. That’s where you have to decide what you want to do, and what you can do. If you can’t do it where you are, then my best advice is to get somewhere working for somebody where you can. Because things will eventually disintegrate if you keep resenting the mandates from above. Focus on yourself by focusing on your number one customer, your boss. It’s a concentration will demand you avoid the distractions of the office gossip parties and all the other noise that happens as organizations second guess the boss. In a recent episode of CNBC’s The Profit, Marcus Lemonis walked into a beauty salon and found all manner of merchandise. There were hair care products, knick knacks, jewelry and even apparel for sale in the first few feet of the store. He told the owner of his confusion when he first walked in. As is often the case on that show, Marcus hones in on the focus of the business. Turns out this salon owner had her own line of hair care products. The margins on those were in excess of 70% while all that other stuff had a margin, at best, of about 30%. From a business perspective it was a no-brainer. Devote more space to your own products, which are congruent with the salon business, and get rid of the rest. That speaks to how many people are distracted though. And the phrase leaps to my mind, “It seemed like a good idea at the time.” So does texting while we’re driving, but it’s dangerous. Once again, I’m drawn to ask, “Why?” Marcus asks the salon owner that question. She didn’t have a good answer. It’s likely that somebody suggested, or came by selling their wares, and she made an emotional decision without thinking it through. Now here’s Marcus walking into her struggling business and it’s apparent to the most novice business among us. But she can’t see it because like all those forms I talked about, it’s been this way for so long she long ago forget why she did it. Lack of focus in business – or any organization – happens when we get up today and repeat what we did yesterday. And we know tomorrow won’t be much different. We’re just pushing to keep our feet moving. But in what direction? Movement doesn’t equal meaningful, or positive action. Hamsters move quickly on a wheel, but they’re going nowhere. That’s exactly where some of our businesses and organizations are going, too. Whether it’s your personal life, your career or your business…now is the time to focus. Or re-focus. When the slightest movement can put a camera out of focus what makes us think that all the movement happening in our lives won’t do the same for us? This isn’t a set-it-and-forget-it kind of a thing. And our lives don’t have an autofocus setting. We’ve got to keep our hand on the focus ring of our own lives and make sure we’re concentrating on the things that matter most. Like that picture of the screws, we don’t have to focus on just one, but we can’t focus on everything either. Focus on your family. Focus on your career. Focus on your friends. There’s 3…and maybe your three look very differently. Mine are pretty simple to state, but crazy hard to remain true to with the intensity they deserve: faith, family and career. Like my favorite one-word question, “Why?” it’s likely because for me all 3 are so closely intertwined. I find that a loss of focus on one can quickly lead to a loss of focus on the others, too. Previous post: What Can You Learn From Bill Parcells’ 11 Quarterback Commandments?